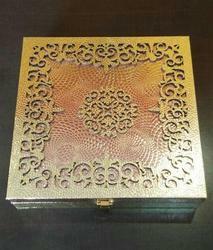 We have in our store an exclusive range of Designer Boxes. These boxes are made using "quality raw material. - GOLDEN OXODISE BOX WITH EIGHT CORNERS . - NO PARTITIONS INSIDE BOX. We are instrumental manufacturer in providing our clients a mesmerizing range of gift box which is an excellent way to treasure cherished memories. 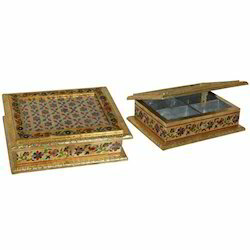 These gift boxes are available in various attractive designs, shapes and sizes. Riding on unfathomable volumes of industrial expertise, we are providing a broad array of Golden Gift Box. 8'' x 8'' golden colour German silver gift boxes with fine quality design on top with fine polish.